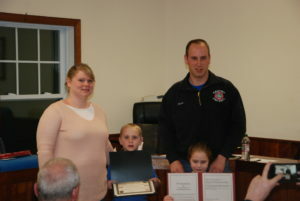 For their heroic actions during a February structure fire, two firemen were honored during the Hampton Town Board meeting last Thursday. State, county and local officials heaped laurels upon the shoulders of Hampton Volunteer Fire Company Chief Matthew Sears and Poultney Fire Department Chief Aaron Kerber, whose quick-thinking and response saved the life of a Hampton resident. “In recognition of your dedicated professional and meritorious service to the residents of Hampton…we recognize your exemplary life-saving efforts during a structure fire on South Road,” said Glenn Bristol, Washington County fire coordinator. Hampton supervisor Dave O’Brien also produced a proclamation from the New York State Senate, drafted by State Sen. Betty Little and Assemblyman Dan Stec, which also recognized the “prompt and heroic actions” of Sears and Kerber.